A/B testing is such important practice that enduro support it out of the box and setting it up could not be any easier. Let's say we have a page in the root folder named contact.hbs. To create an A/B test variant just duplicate this file and add @tag at the end of it's name. Another file's name could for example be contact@bigbutton.hbs. 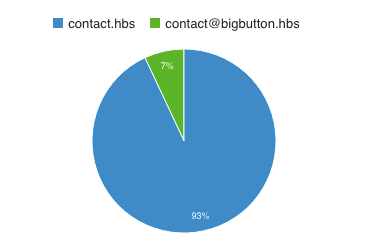 The two files: contact.hbs and contact@bigbutton.hbs will be served with a 50% chance. You can create as many variants as you want and they will always be served in equal ratio. You'll have to use third-party tools to analyze which variant is more successful. This code will register event under name contacttest and uses eventValue attribute to differentiate between A/B variants. For user interface consistency, users that received variant A will also receive variant A on any subsequent reloads. This is guaranteed by a cookie.